The lawmakers from nine opposition parties lifted their month-long obstruction for about ten minutes allowing the government to table the Local Level Election Bill and Election Offence and Punishment Bill, which were first order of business for the House. KATHMANDU, Jan 9: The government has tabled the constitution amendment bill in parliament on Sunday amid obstruction and uproar from the opposition parties. Softening their obstruction in parliament, opposition parties allowed the government to table two election-related bills. Earlier, the opposition parties used to obstruct the House proceedings from the very start. But the lawmakers from nine opposition parties lifted their month-long obstruction for about ten minutes allowing the government to table the Local Level Election Bill and Election Offence and Punishment Bill, which were first order of business for House. 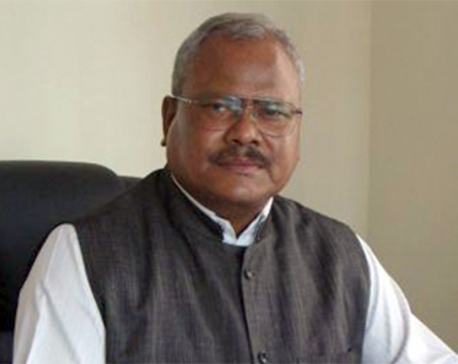 Likewise the House decided to forward the impeachment motion filed against CIAA Chief Lokman Singh Karki to the concerned parliamentary committee with support from the opposition. Then, lawmakers from the nine opposition parties stood up from their seat to obstruct the House, when Speaker Onsari Gharti commenced the business of constitution amendment bill. However, Minister for Law Justice and Parliamentary Affairs Ajay Shankar Nayak tabled the amendment bill, amid the obstruction and uproar from the opposition lawmakers. Opposition parties have termed the government's move as against the parliamentary practice, spirit of the constitution and the recent ruling from the Supreme Court. "The move to table the amendment bill amid the obstruction from the all opposition parties was against parliamentary usage. This is also against the spirit of the constitution and ruling from the Supreme Court," said Subas Nembang, former speaker and deputy parliamentary party leader of the main opposition CPN-UML. However, leaders from the ruling parties claim that there was an understanding between the top leaders from both ruling and opposition parties to table the amendment proposal amid obstruction. "Leaders from the ruling parties had informed the opposition side about the government's decision to table the amendment bill after the registration of the election-related bills," said ruling CPN (Maoist Center) Chief Whip Tek Bahadur Basnet. Ruling parties had decided to table the amendment bill in parliament following a ruling from the Supreme Court last week. Hearing over a writ petition against the constitution amendment bill, the SC had refused to issue in interim order. However, both the ruling and opposition parties have been interpreting the court ruling in their favor. The opposition side has been reiterating that the government cannot table the amendment bill, as it is against the court order. On the other hand, the ruling parties claim that the order does not bar the amendment proposal to be discussed in the House. 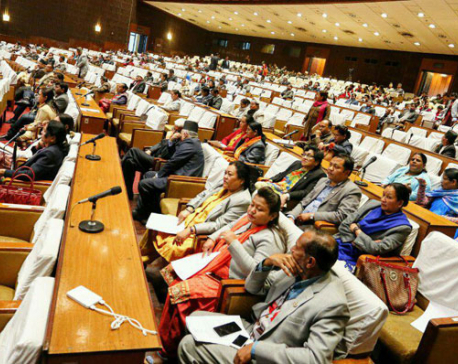 After efforts for over a month to bring the opposition parties on board of the amendment process, the government had decided to table the amendment proposal despite obstruction. The next House meeting scheduled for Monday is likely to discuss election-related bills, said leaders.